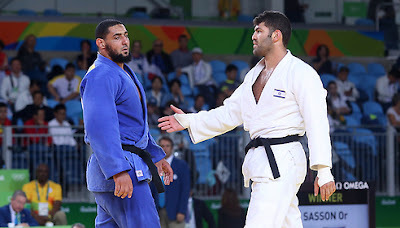 Israeli judoka Or Sasson defeated Egyptian rival Islam El Shahaby in the first round of the men’s over-100kg competition at the Rio Games on Friday, and was left standing when his opponent refused to shake his hand at the end of the match. In judo it is customary to both bow to opponents — a sign of respect in Japan — and shake hands after a bout is over. El Shehaby had been well beaten but stood impassively and then backed away as Sasson tried to shake his hand. As he left the mat area, El Shehaby was called back to the center by the referee to bow. But he was then loudly jeered out of the arena by angry supporters. He later announced he was quitting judo. The story resonates with the long history of social, political and religious schism in the Middle East. Many are defending the actions of the Egyptian, claiming he received heavy criticism online for "shaming his faith and nation" for merely competing with an Israeli at the Games. A handshake at the end of a match is not mandatory. Sadly, disrespect is nothing new in martial arts events at the Olympics. At the 2008 Games in Beijing, a competitor received a lifetime ban from the World Taekwondo Federation after he kicked a referee in the head, pushed a judge and then spat on the floor before being ejected by security. Of course, while the recent tale lacks the blatant violence of this one, it's indicative of the lack of dignity and self-control in the face of defeat. Judo should be free as art and science from any external influences, political, national, racial, and financial or any other organized interest. And all things connected with it should be directed to its ultimate object, the benefit of humanity.